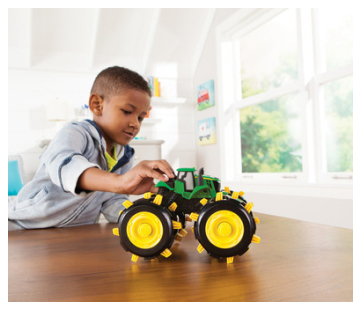 The Johnny Tractor RC is the perfect first radio control for toddlers! Featuring a simple, two-button controller, little ones will love to drive Johnny around while making him twist and turn. Johnny is durable enough to take bumps and bounces, yet soft enough that he won’t mark up walls or furniture. Features an auto shut-off to save batteries. Requires (3) AA and (1) 9V battery. Ages 18 months and up. Produced by TOMY and officially licensed by John Deere.